Hey y'all! I hope your week is off to a great start! As you can probably tell from yesterday's post, I am a big fan of fall! I take pictures of all of the pumpkins I see (my husband makes fun of me for this), I'm all about the leaves changing color, I get a pumpkin spice latte the day they are available, and I sneak away to the mountains as soon as possible to fully experience all that fall has to offer. However, I am 100% okay with this mild weather we are currently experiencing where I live in North Carolina! 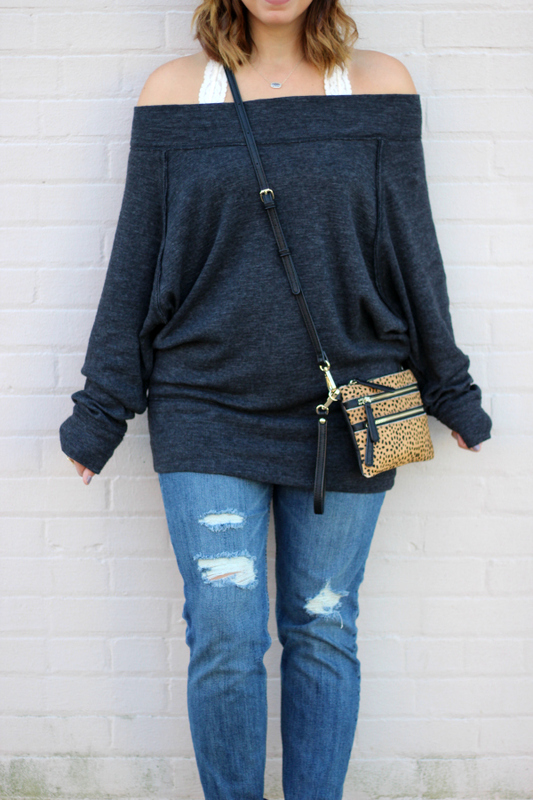 I love being able to throw on a lightweight sweatshirt, jeans, and sandals. I would wear sandals year round if my toes wouldn't freeze off! I love sandal weather. 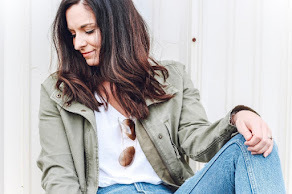 Today, I am sharing a transitional fall look that will work now with the sandals and later with ankle boots. 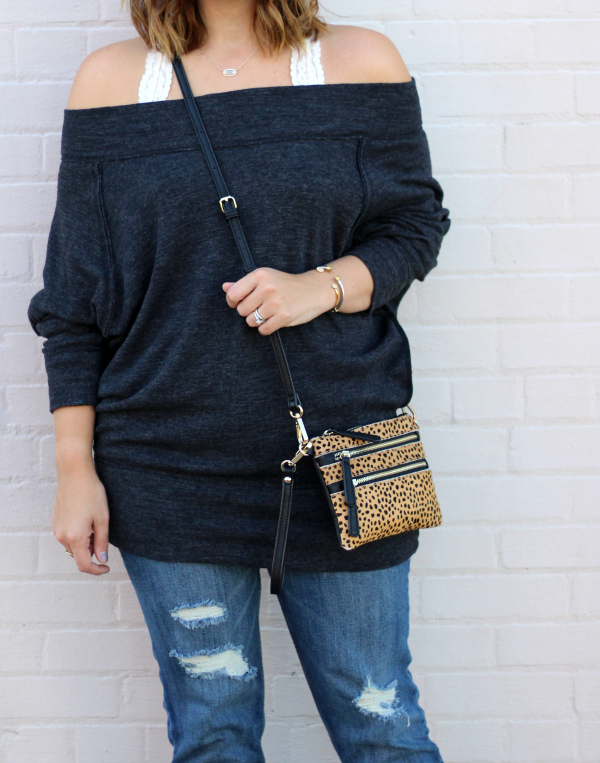 As soon as I saw this off the shoulder top, I knew I needed it in my closet. I have been loving off the shoulder pieces and I especially love cozy ones that you can move in! This top is leggings friendly (which I love) and oversized. I purchased it in a size small and I love the fit! I styled it today with boyfriend jeans, slide sandals, a little leopard print, and my favorite bralette. This is such a great weekend casual top that you will want to live in! Also, if you are a local North Carolina girl, see the invite below for a great event that is coming up this Saturday from 5pm-8pm (floating) at the Kendra Scott store in Raleigh at North Hills! Kendra Scott will graciously be donating 20% off the sales during those hours back to The Dream Center, the afterschool enrichment program that I work at! Come out and shop for a great cause! I'm with you on sandals! Love when the weather is mild enough to feel snuggled up in an oversized sweaters and jeans but I can still slip on my sandals! Love your top!! it looks soooo cozy! Perfect for Fall! Such a cute top! I am loving that bag too. Ohh love this sweater! Given how the weather has been in Ohio I could totally have bought an off the shoulder sweater. So cute! Such a cute fall outfit and I love that bag!! I'm loving how you styled this top! So cute gf! You look so cozy and comfy, I love the fit! Ok, I am OBSESSED with this sweatshirt. What an awesome take on athleisure! You're rocking it!